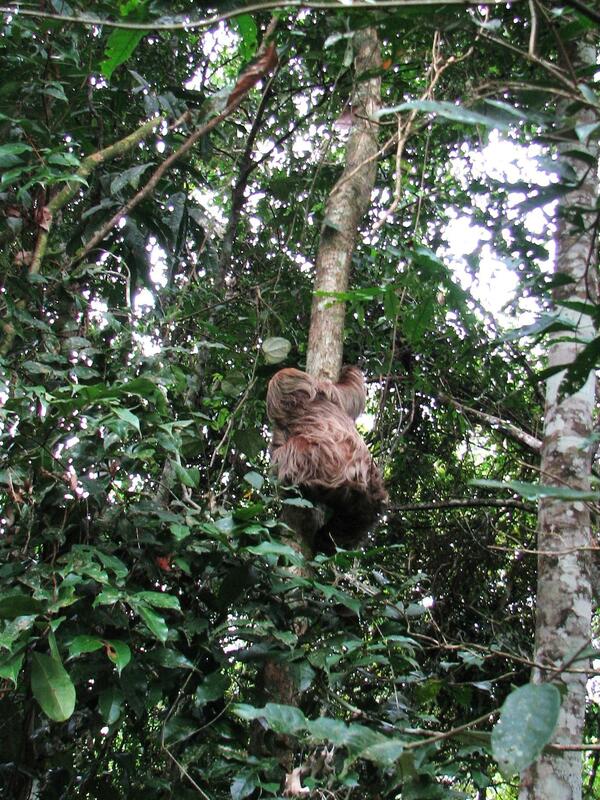 A Rare Southern Two Toed Sloth on the road to Nauta! Some of us stepped out to see what was going on. There was an animal running at one side of the road and 2 men following it with machetes in their hands! 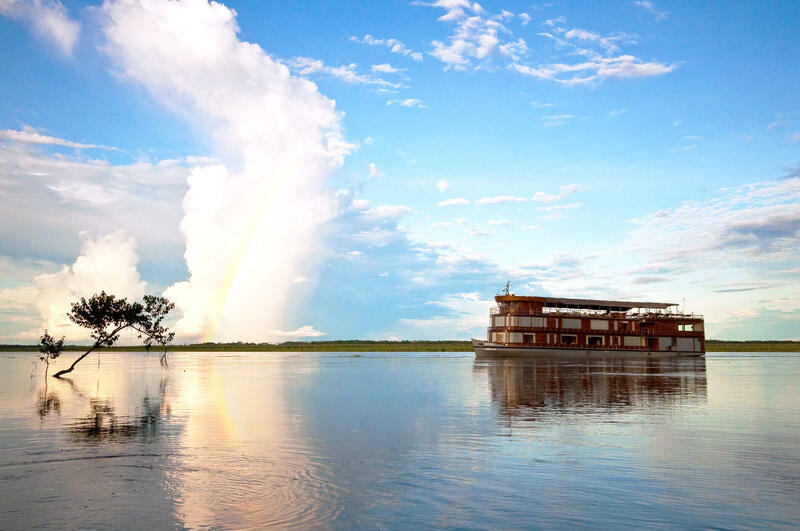 Guide Juan Luis yelled, “We are the wildlife police! STOP! 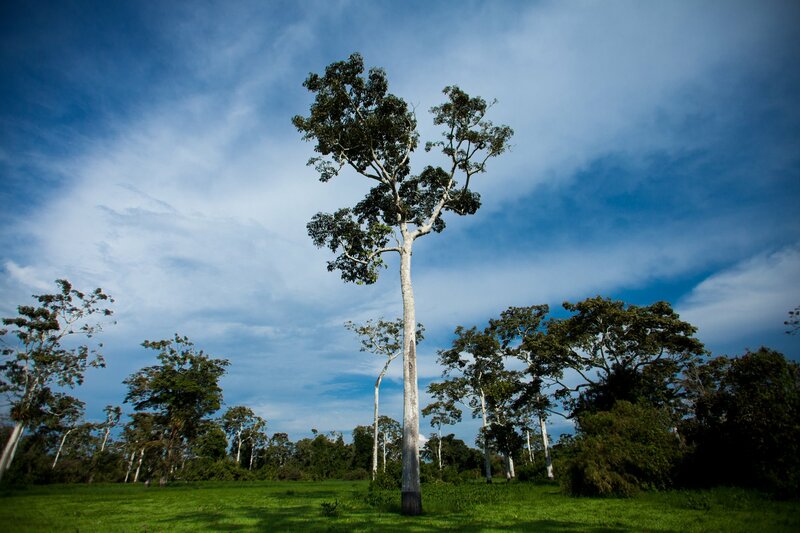 It was then that we realized they were chasing a big sloth running for his life! Jesus had to grab him from his back, but the sloth was fighting back with its long arms and feet. 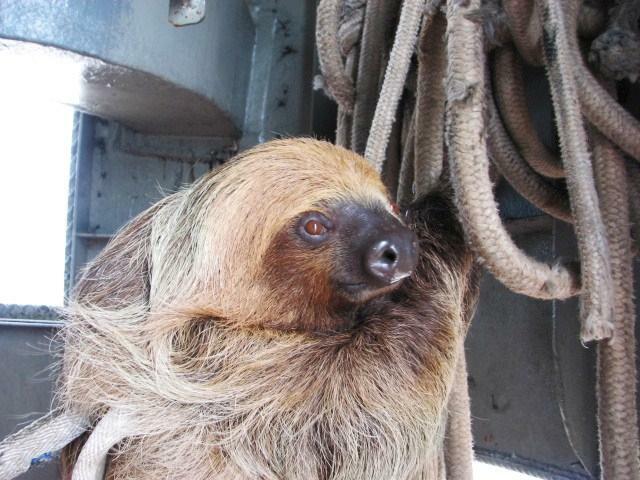 Joel, our driver, had a rope, so Juan Luis tied it to the sloth’s underarms to bring this poor animal into the bus. It was not easy to catch him, but we also knew we couldn’t leave him there with the 2 men, even though it is the sloth’s jungle too. We were all looking amazed at this animal. 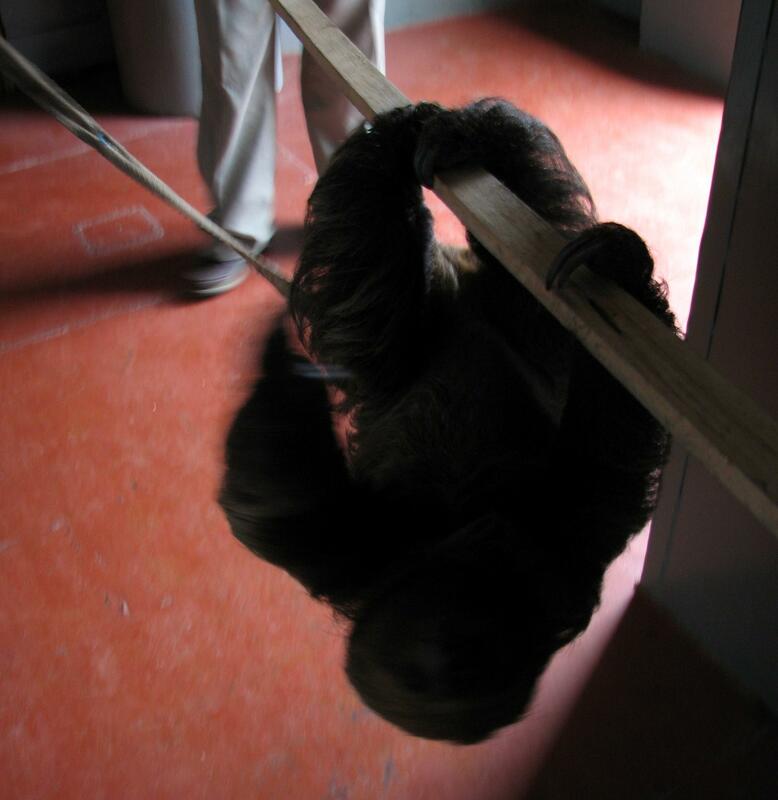 In the darkness, we realized that it was a Southern Two Toed Sloth. They are actually very hard to see in the wild; they are not common in the areas where we cruise, which is flooded forest. Typically we see just Three Toed Sloths. With wonderful dark orange eyes, a large and strong nose and hair so beautiful that you can’t imagine, he simply enchanted all of us in the car. It was a very healthy adult male who was looking at us with so much sadness in its eyes, we knew he was scared and having a terrible time! 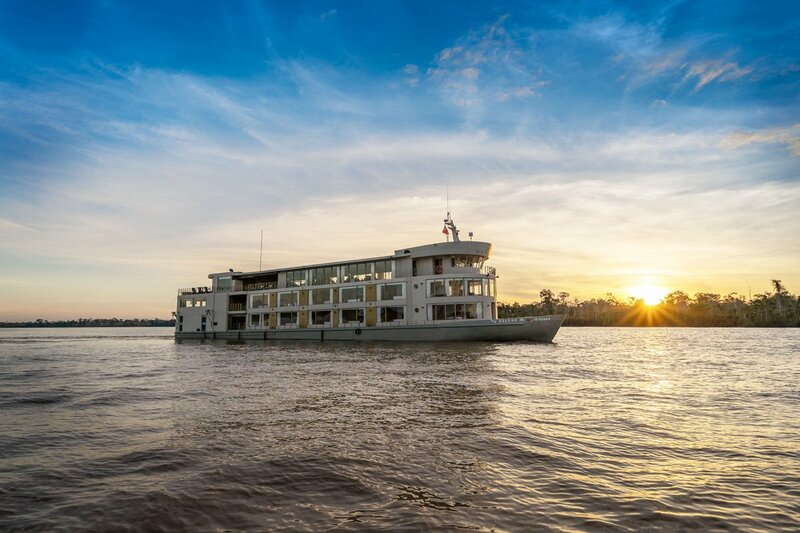 When we reached our private embarkation port, he was taken aboard the Delfin II with us. The experienced guides put him in a safe place where he would not harm himself. We wanted him to be safe and to feel as comfortable as possible, even though we knew he would stay stressed until he was freed again! For dinner, we gave him fresh lettuce. The next morning before breakfast, we took some final pictures with our new sloth friend before getting ready for our morning activity. We would take him with us and set him free inside the Pacaya Samiria Reserve. Still, he fought hard to avoid being handled. After a struggle, he finally he held himself into a stick so we could move him. 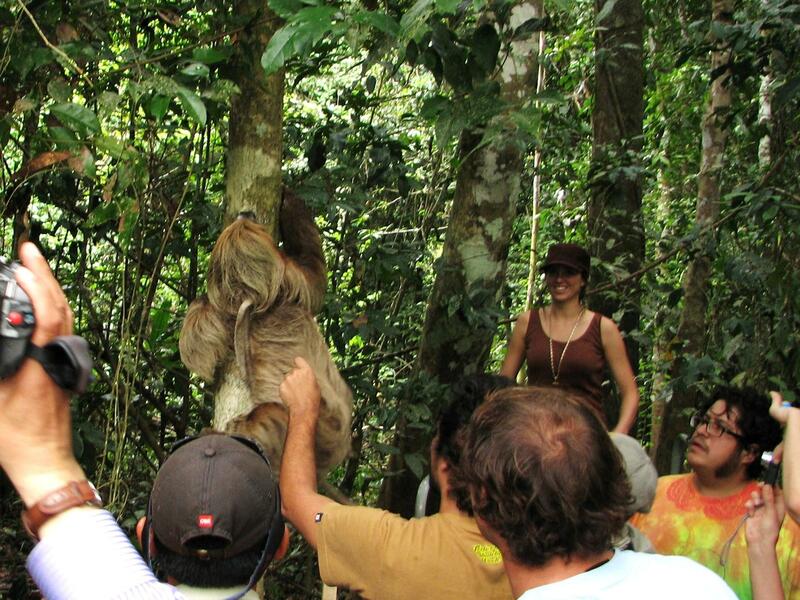 Even our guides hadn’t seen this type of sloth in 8-10 years! Sloths belong to the Edentate family meaning literally “without teeth”. Ant eaters and armadillos are also of the same family. There is nothing like a sloth. They vaguely resemble monkeys, but their slow motion lifestyle is the very antithesis of most primates’ hyperactive life! Here in Peru there are 2 families of sloths, Two Toed & Three Toed, and they differentiate by the number of claws they have per foot. 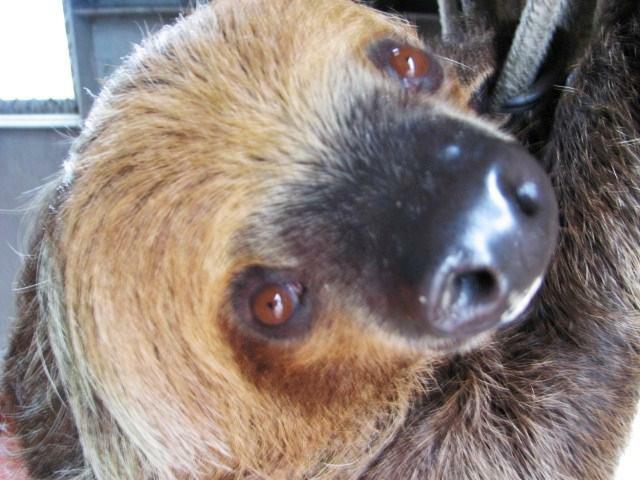 The two toed sloth weighs about 5 to 8 Kilos (11 to 18 pounds) and is active only at night. As soon as we gave him his first tree, he grabbed himself onto it and climbed up into the branches as fast as possible. Everyone clapped and we kept watching him, seeing his new expression of happiness of freedom. 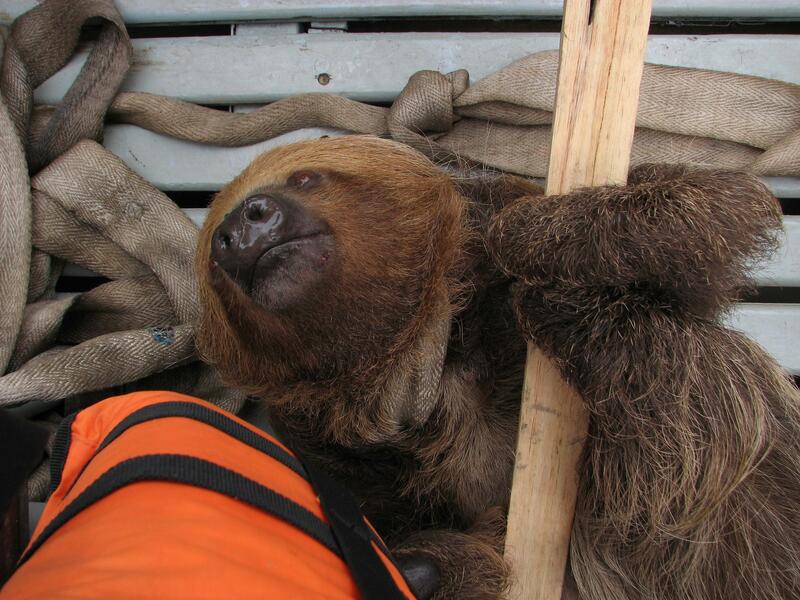 Thanks to our wonderful naturalist guides Jesus and Juan Luis for helping to spot and save this sloth’s life!